One of Germany’s best-known ciders, Bembel-With-Care, will bring its authentic, 100% apple cider to the United States for the first time, debuting in Philadelphia on June 14 and Boston on June 15, followed by New York City on June 16. Known in Germany as apfelwein, the popular gluten-free product is crisp, refreshing, perfect for summertime sipping and available in both kegs and the sleek, hand-designed 16-oz. cans that are wildly popular among craft beer drinkers. The cider has won European acclaim for offering a not-too-sweet alternative to traditional high-sugar hard ciders, while the Bembel-With-Care brand has been developing a cult following for its quirky, outside-the-box approach to a usually subdued genre of alcoholic beverages. Bembel-With-Care has produced cider in Germany since 2007, when the company saw the time-honored beverage was starting to gain traction with wine and beer drinkers alike, quickly filling the gap between redefining a classic beverage and preserving cultural heritage. In an effort to accelerate cider’s long-term renaissance, owner Benedikt Kuhn began adding carbonation to the company’s apfelwein. Germans had traditionally produced flat, dull ciders. 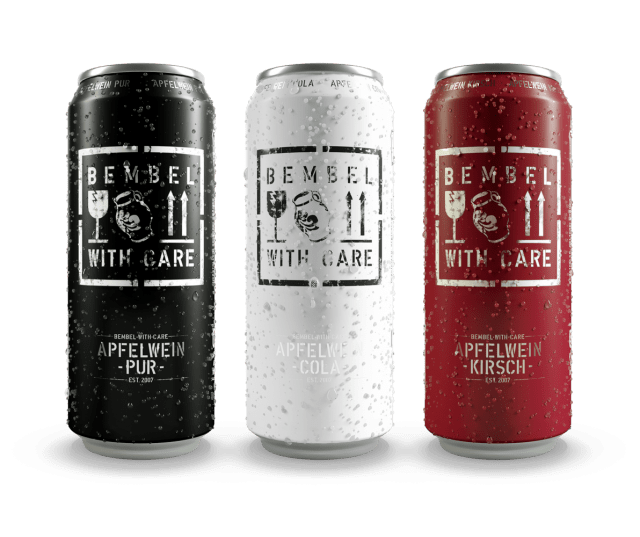 For its United States launch, Bembel-With-Care will introduce three interesting and fizzy flavors, including Apfelewein Pur, a classic all-natural dry apple cider; Apfelwein Kirsch, a tart apple-cherry all-natural cider; and Apfelwein Cola, a sweet caffeinated cider infused with cola. All are made with 100% fruit using traditional recipes and not-from-concentrate juice, rather than additional manufactured sugars. Paying homage to old world methods, Bembel-With-Care uses only fresh apples from the famed Odenwald orchards, plucking them ripe off trees in the lush meadows of the Forest of the Odes in Hessen, Bavaria and Baden-Wurttemberg in Germany. These sturdy apples have grown in the controlled climate of the Odenwald for centuries in near seclusion, with the sole purpose of one day rolling down the hills in barrels to be enjoyed as apfelwein in the surrounding towns and cities. Bembel-With-Care will debut in Philadelphia on June 14 at Brauhaus Schmitz (718 South Street) from 5–8 p.m., in Boston on June 15 at Bronwyn (255 Washington Street) and in New York City on June 16 at Zum Schneider (107 Avenue C). On June 18, Bembel-With-Care will be available to the public at all three Tria Cafes in Philadelphia as part of the restaurant’s famed weekly Sunday School menu. Bembel-With-Care will launch in additional cities and states in the coming months, including Massachusetts, Maine, Rhode Island, Maryland, South Carolina, North Carolina, Florida and Ohio. More information and less marketing would be nice. “Infused with Cola” … really? Pray tell how the climate in the Odenwald is “controlled”? “Grown for centuries in near seclusion” … what is that supposed to mean? Odenwald is a big tourist region within Germany – hardly secluded. How about telling us how this brand compares to some of the other nascent craft cideries in Germany. It is clear that these are ciders produced to appeal to the American sweet tooth as they bear no resemblance to a traditional German cider, or even it’s modern interpretations. Everyone needs a marketing hook, but it’s disappointing to read this kind of distortion of reality. Drinking an Appelwein Cola at this very moment. Very nice! Sweet but not cloying. Pronounced cola flavor. Purchased in Poughkeepsie, NY about two weeks ago from Half Time. I will be buying it again.